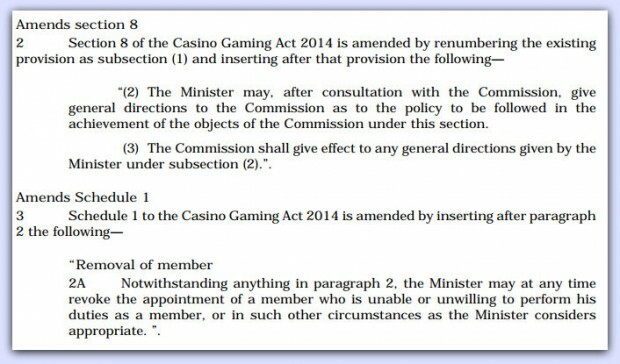 A Casino Gaming Amendment was tabled in the House which will “allow the Government to give policy direction to the Casino Gaming Commission and will allow the Minster to remove members of the commission who do not follow legal directions issued by the Government,” Minister of Economic Development and Tourism Jamahl Simmons said. The Minister also confirmed he has asked for the resignation of the Chairman of the Gaming Commission on three occasions, in August, September and October 2017. Minister Simmons said, “The Casino Gaming Amendment 2017 I tabled brings Bermuda in alignment with other jurisdictions including Singapore regarding Casino Gaming Governance. “The Amendment will allow the Government to give policy direction to the Casino Gaming Commission and will allow the Minster to remove members of the commission who do not follow legal directions issued by the Government. “This amendment will not interfere with the independence of the commission in investigations and enforcement of our Casino Gaming Laws. “Since taking office, I have asked for the resignation of the Chairman of the Gaming Commission on three occasions; August 10, September 27 and October 20, 2017. “In regards to the systematic media misinformation campaign that has brought negative attention to Bermuda and jeopardized our jurisdictional reputation, as I stated, Government is not considering making cashless gaming on the island mandatory for casino operators. “This contrasts with the documented actions of the previous government who introduced “cashless gaming” into Bermuda’s gaming conversation, when they signed a Memorandum of Understanding with MM&I and accepted a $30,000 donation from that company for a pro-gaming campaign in advance of the referendum on gaming that the OBA eventually scrapped. “This Government is committed to having a clean, successful gaming industry that enhances our tourism product and creates new opportunities for Bermudians. Asked about a response to the Minister’s statement, Alan Dunch, who serves as Chairman having been appointed in February 2015, said he did not have comment at this time. Bermuda has a well-earned reputation for being a jurisdiction of impeccable standards of openness, transparency and one that is free of governmental corruption. It is that reputation Mr. Speaker, along with our outstanding infrastructure, our world class regulatory structure and our business friendly environment that have positioned Bermuda as an excellent place to do business and invest. Mr. Speaker, over the past month Bermuda in general and the government of Bermuda specifically have been the target of a systemic misinformation campaign surrounding the gaming industry in Bermuda. A systemic misinformation campaign that sought to damage Bermuda’s reputation and create an atmosphere of uncertainty and suspicion around this government and by extension our fledgling gaming industry. The main issues that have been thrust into the public domain have been whether the company MM&I has some form of contract or agreement with the Government of Bermuda and whether this government intends to implement or mandate a cashless gaming system for casinos in Bermuda. Mr. Speaker, in order to provide some background and context, Honourable Members should be reminded that it was the previous One Bermuda Alliance Government that pledged to hold a referendum on gaming while in Opposition and then once in Government refused to keep their pledge and give our people a voice on this critical issue. I wish to further advise this Honourable House that it was the One Bermuda Alliance Government that first introduced the concept of the cashless gaming system into the conversation surrounding gaming. It was that same One Bermuda Alliance Government that entered into a Memorandum of Understanding with MM&I for them to provide said system once gaming legislation had been passed and casino licenses issued. The same One Bermuda Alliance Government that found itself entangled in the Jetgate Affair. The same One Bermuda Alliance Government that accepted a $30,000 donation towards a pro-gaming marketing campaign from MM&I in advance of the referendum that they eventually scrapped. I wish to advise this Honourable House that this government, the Progressive Labour Party Government has not conceived, considered or given any assurances public or private either that system or that operator will have a presence in our casino gaming industry. The Government has not entered into ANY arrangements with Banyan Gaming or MM&I – That Mr. Speaker, was the previous government. Mr. Speaker, those are the facts. Mr. Speaker, it is apparent that there are individuals who have not accepted the results of the recent general election, do not respect the mandate for change that the people of Bermuda delivered and would rather orchestrate systemic misinformation campaigns, jeopardize the reputation of Bermuda and undermine the government, than engage in a collaborative and mutually respectful relationship for the benefit of Bermuda. Those words now seem oddly prophetic as shortly afterward a select series of email exchanges between my Ministry and the Gaming Commission were “obtained” by the Royal Gazette and an attempt to damage this government and Bermuda commenced in earnest. Mr. Speaker. that attitude may perhaps be further seen in the recent non-participation in the National Anti-Money Laundering Committee’s National Risk Analysis, failure to provide the requested presentation for the related workshops and failure to provide the analysis and conclusions of the working group that the Commission was chairing. The Chairman of the Gaming Commission may want, crave, seek or desire a public fight. Mr. Speaker this government was not elected to engage in petty public fights. This Government was elected to create economic growth, help local and international business to thrive and create a wider range of jobs and opportunities for Bermudians with partners that share this vision and are willing to seek positive action over public fights and job creation over petty squabbling. While others want public fights we seek a Bermuda that with greater economic growth and a diversified economy will bring new jobs and new industries to Bermuda. Mr. Speaker, although there are individuals within the Bermuda Gaming Commission seemingly prepared to drag Bermuda and its reputation through the mud to get their own way, this Government was elected to make change, we have a mandate to make change and we will make the change that the people who elected us sent us here deliver. The Casino Gaming Amendment Bill that I will table today will execute that mandate.